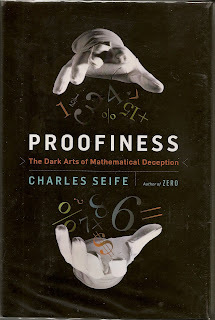 This is an unusual little book about numbers and the way they are used to manipulate us in our everyday lives. From the collapse of Enron to the folly of the color coded Terrorist Alert Levels, Mr. Seife does a wonderful job at showing us just how clever the powers that be are when it comes to deceiving us about almost anything you can imagine. From Political Pollsters to Erectile Dysfunction, the author pokes holes in all of the major concepts which we embrace on the basis of numerical proof, which is often proof of nothing at all. From "pattern matching" to crowd estimates, all is often "smoke and mirrors" when numbers are used as "proof." A very light and easily read book about a seemingly complex subject. That is, if you believe the polls.